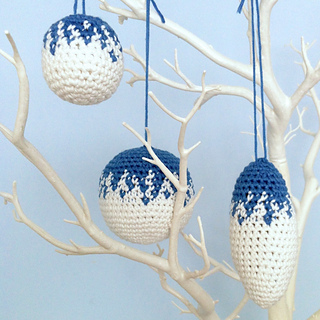 Crochet pattern for three ornaments or crochet shapes. This pattern is for a suite of shapes with three different patterning options that can be used in so many ways, to create just the look you want. Each can be worked in one, two or three colours. The smooth shapes with optional patterning have a fresh modern look, perfect for twig trees as well as traditional Christmas trees. You can really ring the changes with this pattern for different seasons and celebrations. 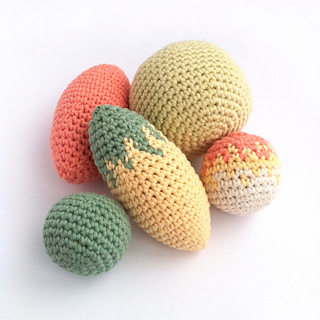 They look great piles in a bowl in colours to accent your room, and can also be made into tactile toys for young children or pets, with or without a bell or rattle inside. Use fuzzy yarn, add sequins or embroidery, you can create so many looks from this one pattern! I love pattern that give a lot of mileage, so I hope you find these designs as useful and versatile as I do. 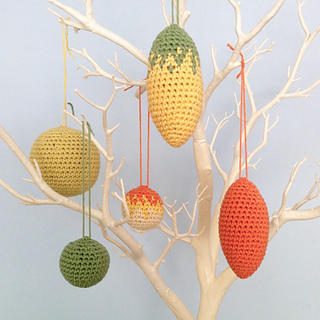 You can make the ornaments with any weight yarn and an appropriate hook - examples of different sizes and the quantities of yarn required are given in the pattern. 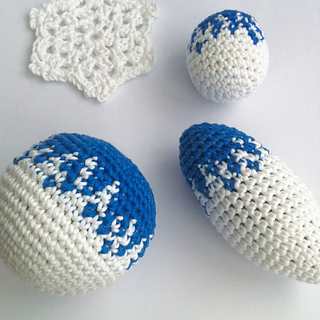 As a guide, made with DK (Light Worsted Weight, Category 3) yarn the small sphere will measure approximately 4.5cm (1¾in) in diameter, the large sphere will measure approximately 7cm (2¾in) in diameter and the lozenge will measure approximately 10cm (4in) long. 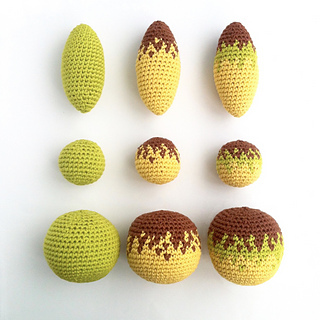 The patterns are available in either UK or US crochet terminology. Both files will be made available to you on completion of payment, and you can just choose whichever you prefer to use. Share your creations and see what others have made with the hashtag #LittleConkers on Twitter, Facebook and Pinterest. All patterns remain the copyright of Little Conkers. You may not reproduce all or any part of these patterns. Please do not sell items made from these patterns, without express prior permission (which is usually granted) and credit.